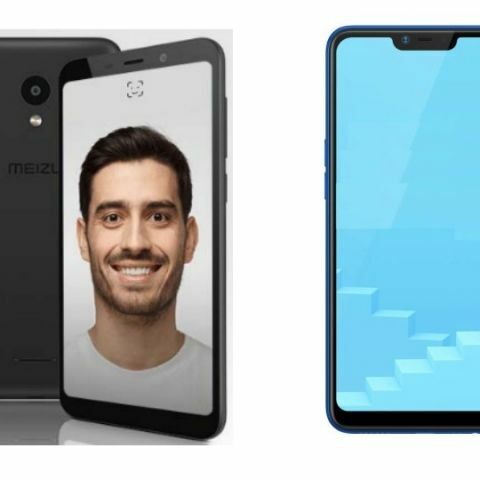 Meizu is going to launch its third smartphone “Meizu C9” on December 5 at Amazon. 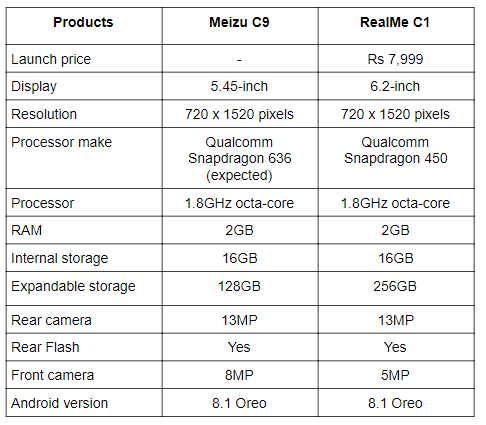 We are comparing the device with the RealMe budget smartphone C1 to see what’s different the Meizu C9 has to offer in comparison to the RealMe C1. The Meizu is all set to launch its Meizu C9 on December 5 at Amazon. The smartphone features a face unlock and 5.45-inch HD+ display. The phone is equipped with a 13MP camera at the back with an 8MP unit on the front. On another side, we have the RealMe C1, which comes with a Qualcomm Snapdragon 450 octa-core processor and features an HD+ display. The smartphone is available in India at Rs 7,999. So, let’s do a quick specification comparison to see which smartphone offers the best value for your money? Let’s begin with comparing the display of these two smartphones. The Meizu C9 sports a 5.45-inch display that offers a resolution of 720 x 1520 pixels. On the other hand, the RealMe C1 sports a slightly bigger 6.2-inch display that offers the same resolution as the Meizu C9. so, if you’re looking for a smartphone that should have a bigger screen then the RealMe C1 might fit the bill. When it comes to the performance, the Meizu C9 is expected to feature a Qualcomm Snapdragon 636 processor. However, it has not been officially confirmed by the company yet. On the other hand, the RealMe C1 is powered by a Qualcomm Snapdragon 450 octa-core processor. As far as the cameras are concerned, both devices come with a 13MP rear camera. At the front, the Meizu C9 sports an 8MP unit, while the RealMe C1 comes with a 5MP sensor. The Meizu C9 will launch in India on December 5 and will be an exclusive Amazon product. On the other side, the RealMe C1 is priced at Rs 7,999 in India.